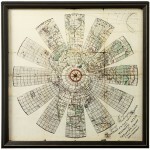 Thomas Jefferson was constantly designing and reinventing furnishings and devices to improve day to day living. 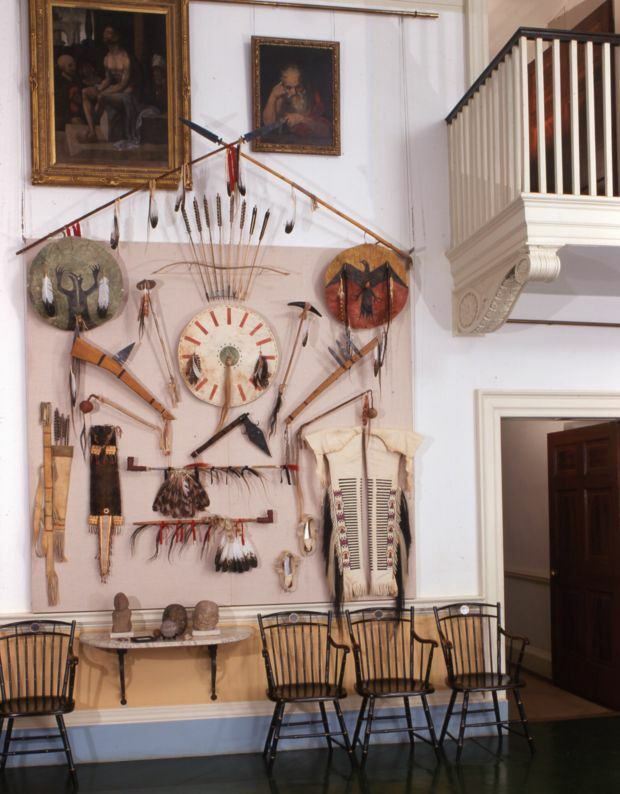 As a “Founding Tastemaker,” Jefferson remains a source of inspiration for contemporary home decor. Modern, alternative uses for these Jeffersonian classics reveal both Jefferson’s ingenuity and the continued functionality of his designs. Among the many fascinating devices found in Jefferson’s Cabinet, this one perhaps most clearly suggests Jefferson’s passion for knowledge. 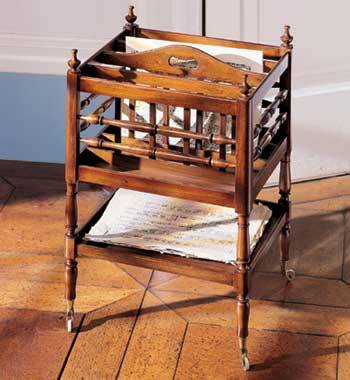 The Revolving Bookstand, once thought to be a music stand, was probably made or adapted to Jefferson’s design and specifications in the joinery at Monticello. 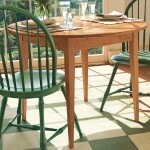 The cube-shaped stand has five adjustable rests that can be folded down to form a cube. A central pole enables the stand to rotate at the bottom and as many as five books could be placed on it at a time. Jefferson may have conveniently placed it next to his chair in his reading-and-writing arrangement. Swap the books for framed photos and this remarkable device can display your friends, family and favorite moments. Made of solid mahogany with a soft, hand-polished finish, the rotating stand holds multiple picture frames at adjustable angles on rests that fold down to form a 12″ cube. The Canterbury is still quite handy, though you’re just as likely to use its four compartments and lower shelf as convenient storage for your most cherished books and magazines. 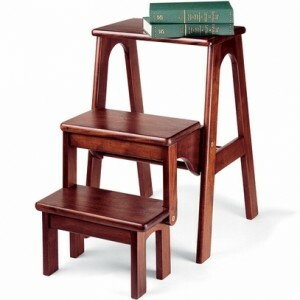 The casters on the legs and handgrip at the top make it easy to move around, allowing your stacks of reading to come with you. Mahogany, with brass casters. How would you use these two timeless Jeffersonian pieces in your home? Post your favorite alternative use below! 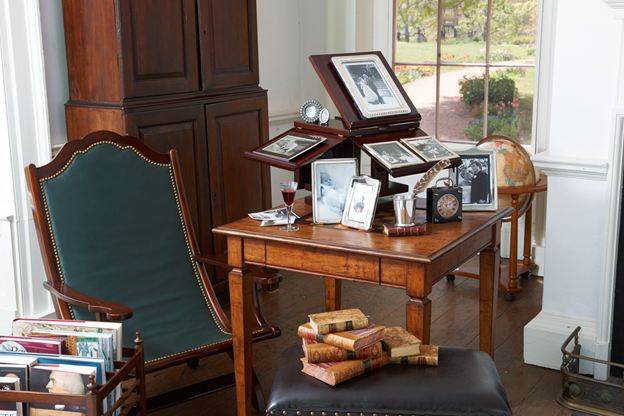 Our Monticello Collection captures the charm of Thomas Jefferson’s home with carefully crafted reproductions of items on display at Monticello. In this video, Bob Self, Monticello’s Director of Restoration describes his involvement in the reproduction process and the history of Jefferson’s Revolving Bookstand. After selling his collection of books to the Library of Congress, Jefferson soon realized he wanted to replenish his library. 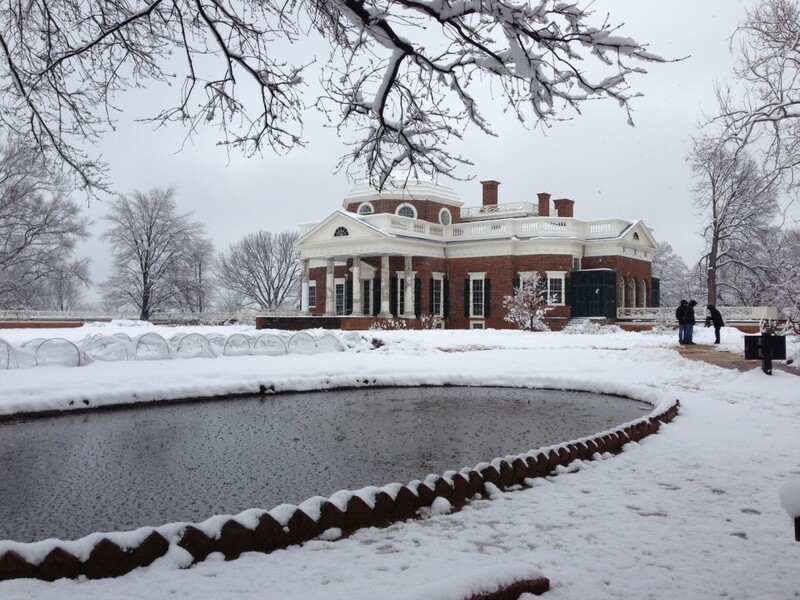 He wrote to John Adams, “I cannot live without books,” and soon began to fill his Book Room at Monticello. Are you a passionate reader looking to create your own comfortable nook to read in? 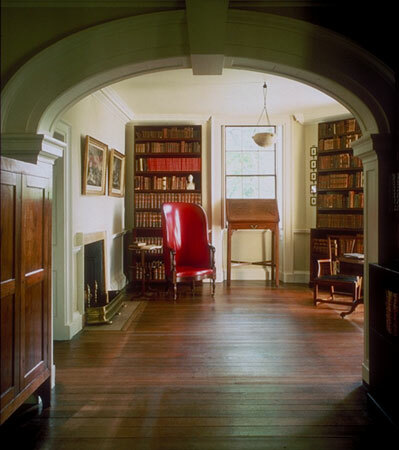 It’s easy to find inspiration for your home library in Jefferson’s own suite of private rooms which included his Book Room, Cabinet or office, Bedchamber and Greenhouse. Furnish your library with these Jefferson–inspired pieces, to create a stylish and serviceable space. The first step to get organized is to find the right shelving. The Library Stand is a striking alternative to your standard bookshelf. 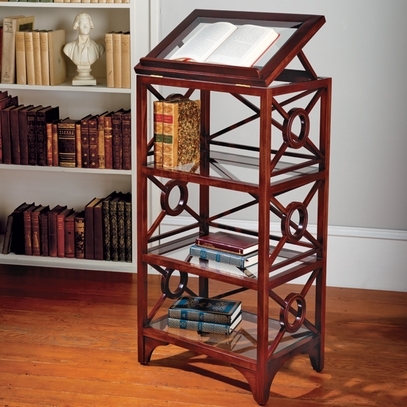 With gorgeous neoclassical fretwork, sleek mahogany finish, and wide glass shelves for ample storage, this piece personifies timeless taste and function. 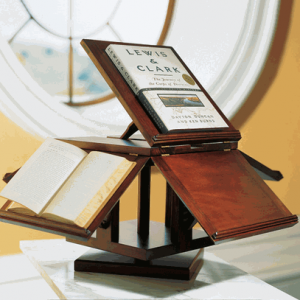 The stand’s special tilting top shelf is a great way to show off an atlas, dictionary, or favorite volume. With four compartments and a shelf, the Monticello Canterbury is perfect place for storing magazines, newspapers, or office files. 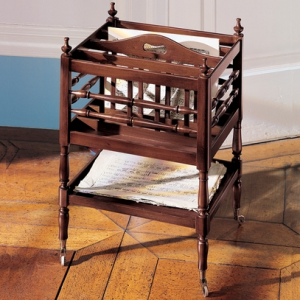 Jefferson and his family used the original Canterbury to store their favorite sheet music. Whether you use it as a handy wood magazine rack or for its original purpose, the reproduction Canterbury is just as practical today. Its top handle and legs with brass rolling casters make it easy to transfer your preferred reading material from home office to your favorite chair. 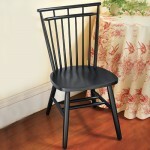 Nothing says classic Jeffersonian style like the Campeachy Chair. Jefferson’s first Campeachy was imported from New Orleans, but he liked the chair so much he had Jon Hemings, a plantation joiner, make copies for both Monticello and his retreat home, Poplar Forest. 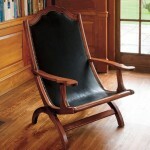 Jefferson used the mahogany chair throughout his Presidency and his retirement, referring to it as, “…that easy kind of chair.” With classic style and a relaxed feel, the chair features an X-shaped base, generous armrests, a serpentine crest rail, and a low-slung seat of reinforced leather. 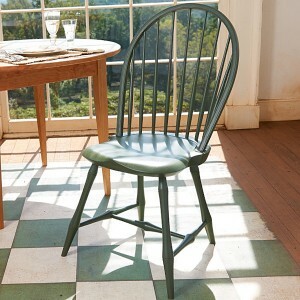 Our reproduction chair is based on the Campeachy chair currently featured in Monticello’s parlor. 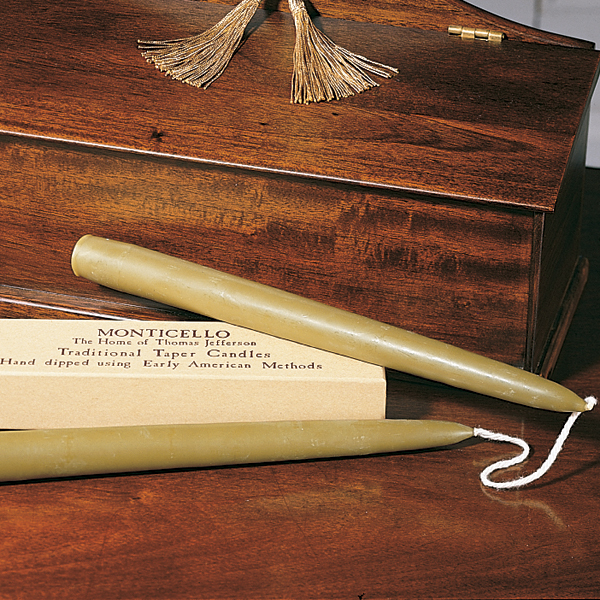 Bob Self, Saunders Director of Restoration at Monticello, claims that particular Campeachy is “the most comfortable” of all the originals and that its reproductions are truly faithful replicas. As a man of impeccable classic taste, it is no wonder that nearly every aspect of Thomas Jefferson’s Monticello estate, including his drinkware, was crafted to his preference. The silver and gold tumblers that appear in Monticello’s Dining Room exude the simple elegance and style popular to the seventeenth and eighteenth centuries. In 1810, Jefferson designed his own tumblers based on one he had acquired in Paris. He contacted Richmond silversmith John Letelier for the project and requested he melt down two silver cups he received at the death of his friend and teacher, George Wythe with two of Jefferson’s own canns (round-bellied mugs) in order to create eight new silver tumblers with a gilded interior. These tumblers were of practical design and intended for travel and everyday use. They feature a low- bottomed, heavier base and a small-sized cup, making them hard to spill. The cup’s silver composition made it more durable than those made from other materials such as glass or crystal. 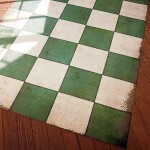 Jefferson’s eight tumblers remained at Monticello for the rest of his life, and were used almost every day at mealtime. 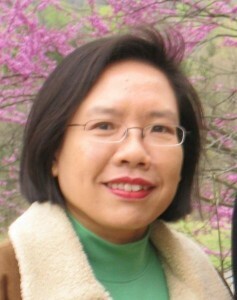 One Monticello guest noted that “beer and cider, and after dinner wine” were all served from Jefferson’s silver cups. Jefferson distinguished his personal collection by having them engraved. Of the five cups exhibited at Monticello, three are engraved with “G.W. to T.J.” (undoubtedly George Wythe to Thomas Jefferson), while the other two are simply engraved “T.J.” In the 1830s Jefferson’s daughter, Martha Jefferson Randolph, gave one cup to each of her six children, and one to a grandson. Since then, only six of the original eight survive. The Shop offers a beautiful Sterling Reproduction Cup, which can be personalized just as Jefferson did with his own collection. Crafted with the same classic elegance and quality as the 1810 originals, these cups are multipurpose for any room in the house. They are beautiful accent pieces and great for holding small items on your desk or dresser. Their customizability also makes them wonderful wedding or graduation gifts that will never lose their timeless significance. 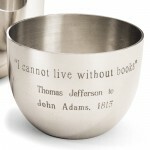 In addition to the Sterling Reproduction Cup, the shop offers three additional tumbler styles: the Pewter Jefferson Cup, the Book Quote and Wine Quote Pewter Cups, and the Monticello or University of Virginia Seal Jefferson Cup. Each unique cup gives you the opportunity to bring a piece of history into your home with a personal twist. 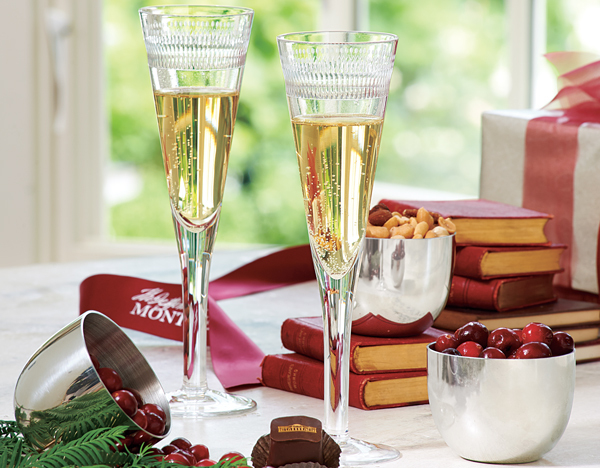 The Jefferson Cup is great for anyone—whether a book lover or a University of Virginia graduate, a wine connoisseur or a Jefferson enthusiast—making it a perfect gift for any occasion.